40 Years Ago, There Was a Poster at the American Heart Association Meeting…. It’s a meaningful poster, since it was the first public presentation of the concept and initial studies of something called “Percutaneous Dilation of Coronary Artery Stenosis” or simply, coronary angioplasty. This procedure had not yet been done in humans, but this poster directly led to that ground-breaking development within a year. 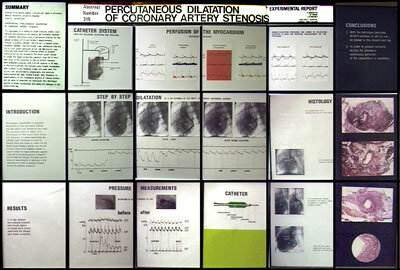 The complete story of how the concept of angioplasty evolved from the early peripheral work of radiologist Charles Dotter up to the acceptance of the procedure and training of the first generation of interventional cardiologists is told in my award-winning feature-length documentary, “PTCA: A History” (yes, yes…you can purchase it online). So, in the spirit of TBT, I’m posting a short clip about this infamous 1976 AHA poster. You’ll note that many physicians, including those who later became the pioneers of angioplasty, initially thought Gruentzig’s idea was crazy. In fact, it was rejected by the cardiology panel for presentation at the AHA, but was accepted by…the radiologists!